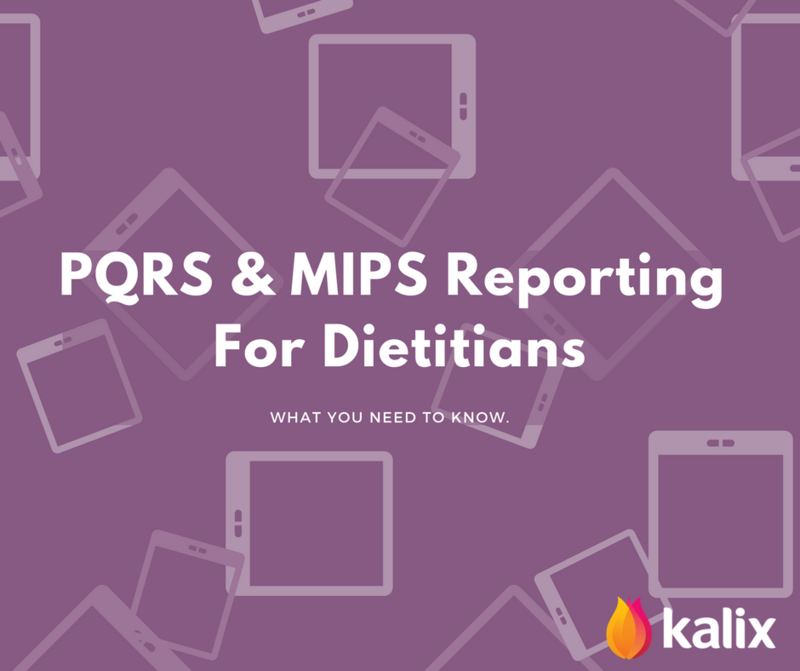 All You Need to Know PQRS & MIPS (Dietitian Edition) – The Official Kalix Blog. The Physician Quality Reporting System (PQRS) was a quality reporting program by Medicare that applied to all Registered Dietitians (RDs) and other eligible professionals that received payments under Medicare Part B (via CMS 1500 claim forms). To encourage participation Medicare applied a negative payment adjustment (reductions) to all Medicare payments when non-compliance or unsatisfactory reporting occurred. For the 2016 PQRS reporting period, Kalix was approved by Medicare as a Qualified Registry. To our knowledge, Kalix was the first and only Dietitian specific PQRS Registry. The Physician Quality Reporting System (PQRS) ended in December 2016 and was replaced by Merit-Based Incentive Payment System (MIPS). MIPS has many similar aspects to PQRS, however, it a new system combining three different quality programs: Meaningful Use, PQRS, and Value-Based Payment Modifier programs. While Registered Dietitians were considered as eligible professionals under the PQRS program, they did not qualify for Meaningful Use or the Value-Based Payment Modifier program. As a brand new program, MIPS has new eligible criteria. At least for 2017 and 2018, Registered Dietitians (RDs) are not considered eligible, click here for further details. There are yet be any announcements about whether the eligible clinician group will be extended for 2019 and beyond. Medicare is seeking to reduce the burden of MIPS program participation by the introduction of new exclusion criteria. Newly enrolled Medicare providers and clinicians with low volume threshold are currently excluded. CMS has stated that they will allow non-eligible providers i.e., RDs to participate in MIPS during the 2017 and 2018 reporting period on a voluntary basis (without any possible payment adjustments). Unfortunately, there is currently a lack of information about what voluntary participation looks like. 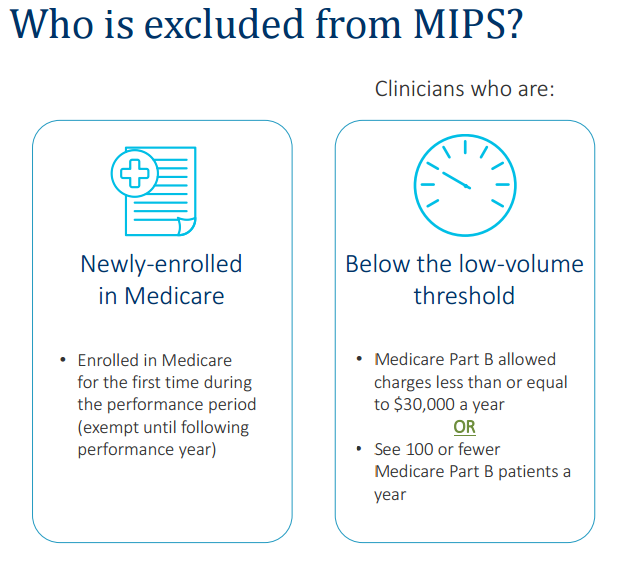 Medicare states that MIPS moves Medicare Part B clinicians to a performance-based payment system providing “clinicians with the flexibility to choose the activities and measures that are most meaningful to their practice.” MIPS performance activities are classified into four categories. Clinicians can select applicable activities from each category. Report up to 6 quality measures, including an outcome measure, for a minimum of 90 days. Quality Measures are the same as those included in PQRS 2016. Participation can be via claims, a qualified registry or a certified EHR system. No data submission required. Calculated from claims. *If considering voluntary participation, RDs may not need to submit data on these measures. There are yet be any announcements about whether the eligible clinician group will be extended to include Registered Dietitians in the future. Personally, I am hopeful for future participation. As a profession, we do not want to be excluded from MIPS forever. There could be serious financial implications for Medicare reimbursement rates for RDs in the future. It is reassuring that voluntary participation by non-eligible clinicians is allowed for the next two years. CMS has also made changes to some of it’s MIPS component programs (i.e., Quality- replacing PQRS and Advancing Care Information – Replacing Meaningful use) to make them more flexibility and hence improving their applicability to non-physician healthcare professionals. I was also pleased to notice a change in CMS’s language, they are no longer referring to healthcare providers as physicians (i.e., Physician Quality Reporting System) but announced officially the use of the term “clinician” instead. This is much more of an inclusive word. At Kalix, we are dedicated to ensuring our program meets all Medicare’s requirements for the future. We have made the decision to retire our PQRS Registry feature for this year (2017) so that we can concentrate on other new features and functionalities like Telehealth. Participation in the Quality component of MIPS can still be achieved for 2017 via Kalix’s claims and billing functionality. It is our goal that Kalix will have built-in MIPS functionality if (or when) RDs become a MIPS eligible profession.